Western Whiskey Gazette (WWG): California Gold Discovered in Washington state. California Gold Discovered in Washington state. California Gold Discovered in Washington! Every so often a rare and beautiful bottle surfaces, and causes ripples in the hobby. It happened to a friend of mine recently, and the story bears repeating. It seems that "Ted" got a call recently from a lady who said "I read your ad in the newspaper about wanting old bottles. "I have some... are you interested?" After tracking down so many dead end leads, Ted's enthusiasm for following up had cooled considerably, but hesitantly he asked her to describe them. 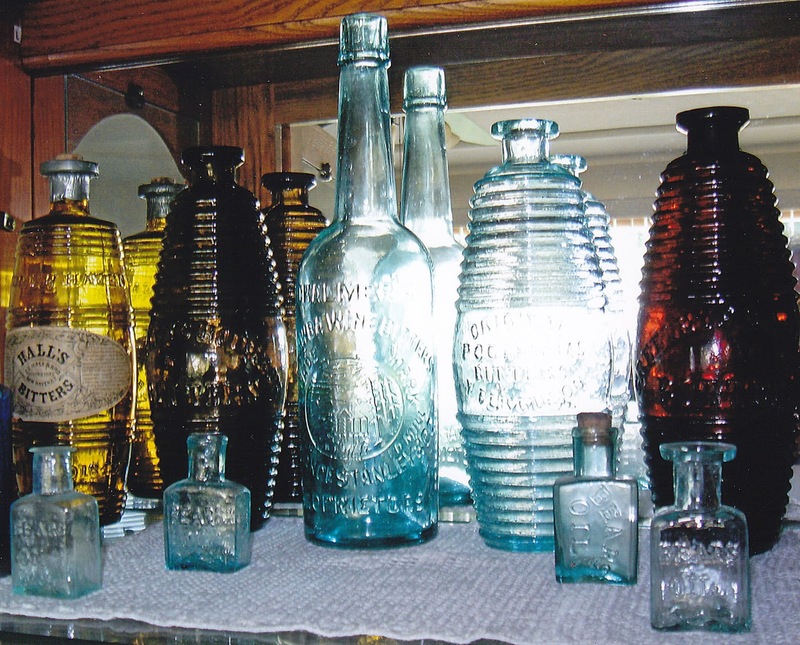 As soon as he heard her say "Catawba Wine Bitters, with a picture of a cabin", he knew the bottle immediately. By the next afternoon he had the bottle sitting at home, on his shelf. The owner said that she'd found the bottle years in some mine tailings near Eureka Nv. She and here husband used to live in the area, and she'd fished the bottle out of the dirt, and taken it home with her, "cause it was so pretty". 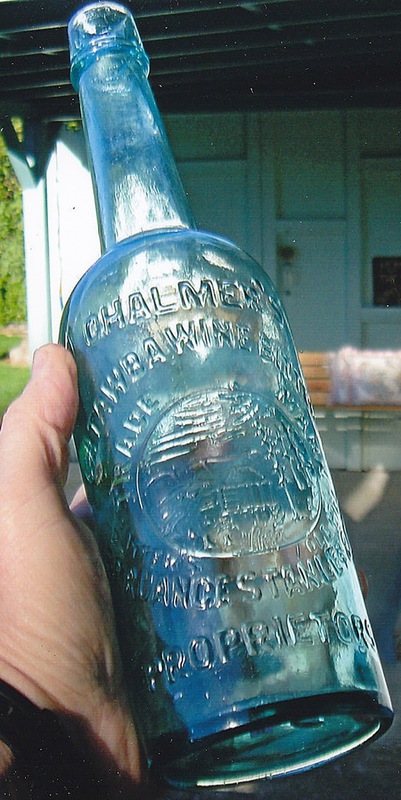 The bottle that Ted had purchased was a rare 1872 Chalmers Catawba Wine Bitters / Spruance Stanley & CO. that pictures a log cabin with Old Sutter's Mill below. 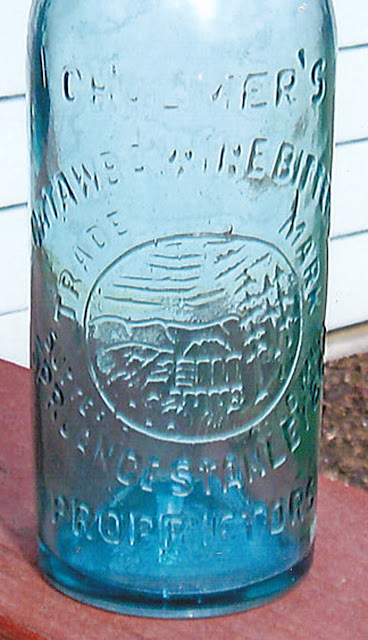 These aqua cylinders are a true historical commemorative bottle for the West, and celebrates the California Gold Rush, which began at Coloma at Sutter's Mill in 1848, and is clearly depicted on the embossing. Blown in 1872/73, the majority of these were shipped to Nevada, and supposedly to Utah. From written and "word of mouth" information, 3 have been dug in Belmont. One well known example was unearthed behind the Cosmopolitan Saloon on Easter Sunday, 1980, and is reportedly the best of the three dug in Belmont between 1977 and 1984. No examples have been reported being dug in Utah, but a written history of the vineyard where Catawba Wine Bitters was produced, clearly shows the majority of this product was shipped to Nevada and Utah. Spruance Stanley & Co. were the proprietors of this bitters between 1872/73 when the vineyard discontinued growing Catawba grapes. The bottles that held the Chalmers Catawba Wine Bitters are not only beautiful, but have brought record prices at auction over the past few years. There are 12 to15 known examples in any condition. 2 changed hands in Feb. 2010, one through the American Bottle Auction #49, and the second, privately for and undisclosed amount. Since then, others have been to auction, and as recent as Sept. 2015, another was listed on eBay for $22,000~ by a New York collector. Obviously. Ted's recent find will cause ripples with Western Bitters collectors, and proves to all in the hobby, that good bottles are "still out there" just waiting to be discovered. FOHBC - National Expo - Sacramento Ca.